Carbon monoxide is odourless, colourless and deadly. It is the most common cause of fatal poisoning in Britain today. Pregnant women, children and people with heart conditions are particularly at risk, but CO can be lethal to anyone. This silent killer is produced by the incomplete combustion of the fossil fuels most of us use on a daily basis. Amongst these fuels are natural gas, lpg, oil and wood. Any appliance which burns these fuels could be at risk if not properly maintained. There have even been cases of fatalities caused by barbeques. 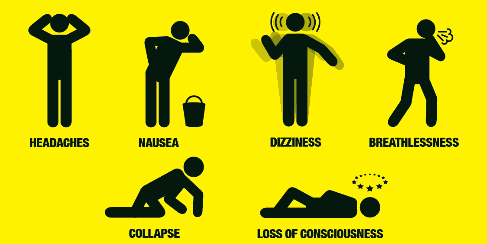 Often, symptoms associated with carbon monoxide poisoning are mistaken for those of other illnesses, such as influenza. Common indications are headache, nausea, chest pains, erratic behaviour, vomiting, dizziness and general weakness. These vary depending on a number of factors, including the duration of exposure to the gas, age and general health. The best way to combat carbon monoxide poisoning is prevent it from happening in the first place. Have your appliances regularly checked and if you see any tell-tale signs, such as soot formation, yellow flames in gas fired appliances or increased condensation on windows, call a qualified engineer. Don’t forget, it’s not only natural gas which could produce CO. Any fossil fuel could, so be aware. Carbon monoxide detectors are reasonably cheap, readily available and could save the life of you and your family, but please make sure that you have read the instructions that come with the alarm and that you check the batteries; it’s no good having a CO alarm in the room if the batteries are dead. Check in the instruction book or ask advice from your engineer as to where to position the device. Before you buy a CO alarm, ensure that it carries a European or British mark. Always ensure that the room in which the appliance is situated is sufficiently well ventilated for that appliance; your engineer can help you with this. Never, ever, ever block air bricks, grilles or any other form of ventilation unless you are one hundred per cent sure that it is not serving an appliance. If you are having a new appliance installed, make sure that the engineer is competent. In the case of gas appliances, you can do this by checking the ‘Gas Safe’ register. Every ‘Gas Safe’ engineer carries an identification card; check it. If the alarm sounds on your CO detector, rather than settling down by the fire in the armchair with the instruction book, take it outside to read it. Don’t forget to take your family and pets with you. If you suspect there is carbon monoxide in the atmosphere, turn off the appliances, open all doors and windows and call an engineer. If any of your family members are showing symptoms of CO poisoning, seek medical help. It makes good sense to have your appliances checked on a regular basis. Your engineer will, where possible, carry out an analysis of the flue gases leaving the appliance. He/she will also advise you on ventilation and other safety issues regarding the installation. When you consider the cost of an evening out compared with a boiler service, it just seems incomprehensible that there are still many people who don’t have their central heating boiler and other appliances checked at least annually. When you have your boiler serviced, ask the engineer to take a look at any other gas appliances you may have, especially gas fires. To sum up, the old maxim ‘better safe than sorry’ has never seemed more appropriate than in the case of carbon monoxide poisoning. It is preventable.